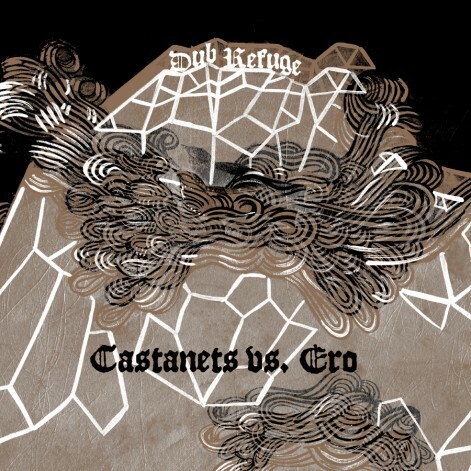 At it’s best, Castanets music accomplishes an eerie and very difficult balancing act between the disaster-surfing of experimental and noise music, and the sort of calm competence shown by classic country singers. The City of Refuge sessions to my mind exemplified this balance, and I have tried to emphasize both aspects without destroying either. So I wanted to make sounds from his music that respected the realism and naturalism of the source material (hums, buzz, the acoustic signature of motel and cheap microphone) while adding in additional depth of reference and providing some clouds of unknowability, in order to emphasize the more spiritual and aggressively ‘out’ aspects of the music. I also love the driving warmth of certain classic dub sources: King Tubby, Scientist, Burning Spear, Sly and Robbie. I felt that trying my best to turn a minimalist folk record into dub would be a worthwhile course– I wouldn’t accomplish it, but trying was worthwhile. Decaying tape echo, slowly dissolving blasts of noise, rimshots and filtered snare drums wobbling off the edge of syncopation, and richly resonant bass notes: I did not make these sounds integrate perfectly with the source material. In fact, I didn’t come even remotely close to making an album that sounds like classic dub. But that sound never for a moment left my mind as a goal. Lastly, the City of Refuge album has emotional power (the songwriting is magnificent, and Ray’s gift for finding unusual and effective sonic combinations is superb) and I hope that Dub Refuge does too. I’ve done my best to leave the loneliness, paranoia, and meditative qualities intact; I’ve tried to enhance some of the underlying beauty of the songs.